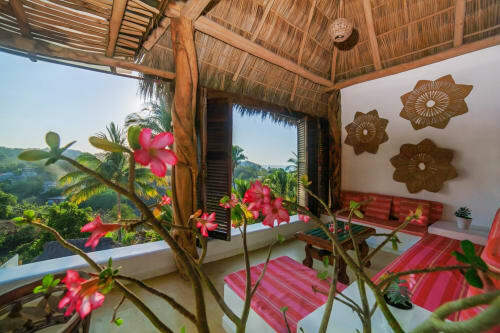 Villa Tranquila in Sayulita is a 2789 sq. ft. Premium two bedroom, two bath unit located in the boutique hotel Villa Amor, There are never-ending views from the entire Villa. 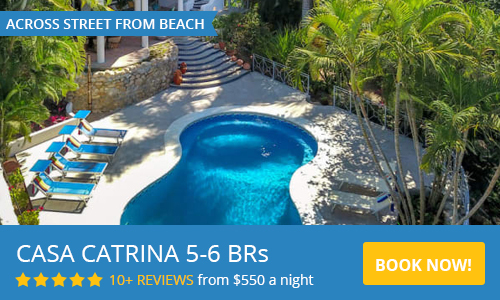 This Villa is located on the third floor of the newer building of Villa Amor and features a private jacuzzi tub in the master bedroom, a full kitchen and generous seating. Villa Amor facilities are included with access to an incredible infinity pool, private outdoor seating, daily yoga and the brand new on site famous Si Senior Restaurant. The entrance to Villa Tranquila is through a gated and private entrance which welcomes you to the beauty and serenity that the name implies. As you enter the Villa proper, the expansive Pacific Ocean views will take your breath away. Underneath the wide ceilings and beautiful antique lamps, the villa is tastefully furnished with everything you will need for the perfect vacation. The two bedrooms are located on opposite ends of the villa, each with their own private bath. 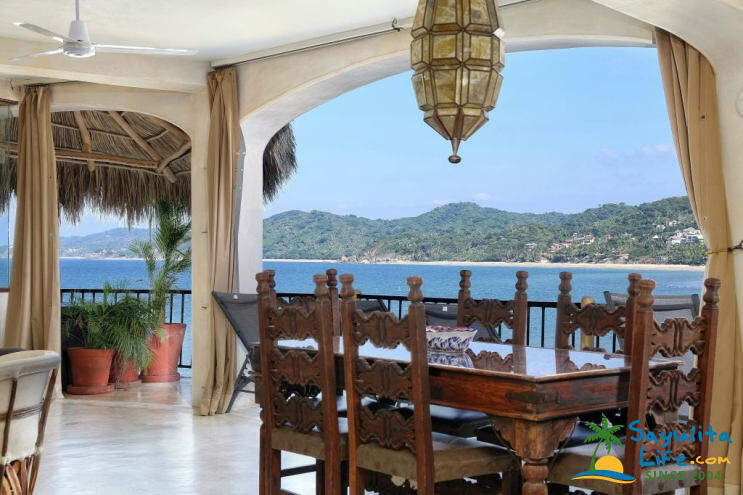 This Villa can also be rented in combination with Villa Tranquilita, making this a perfect 3-bedroom option for couples or families. Perhaps the most enjoyed feature in this villa is the large terrace with lounge chairs and a private jacuzzi tub. This is the perfect place to be morning, noon, or evening. We do have other Villas in Villa Amor so let us know how we can help you! Villa Tranquilla at Villa Amor was beautiful. Pictures simply will not do it justice! The Open Concept floorplan and the sound of the ocean made it very difficult to go into town, much less leave when our vacation was over! So very fortunate to have stayed in this beautiful Villa that was incredibly appointed with beautiful furniture and endless details that must have taken years to acquire. It's located on a wonderful property that's maintained 24 hours per day. Villa Tranquilla is about 2,100 sq. ft. for a one bedroom which can also be used as a two bedroom for a bigger group which would increase the size even further. The restaurant on the property (Si Senor) was great as well. In fact, we ordered delivery one night because we simply did not want to leave the Villa. We cannot wait to go back to Villa Tranquilla at Villa Amor. 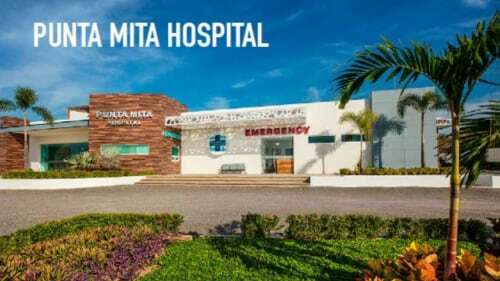 The service and attention we received from Lina, Mitch, and Esteban was superb. The owner Mark also followed up and made sure we had the very best stay possible. Exceptional! We cannot wait to return. We loved our 5 night stay at Villa Tranquila. Mitch and Lina arranged transportation to and from Puerto Vallarta with a stop at the grocery store to stock up. The unit is breath taking in its beauty and view and comfort. Waking up to the sunrise every morning was magical. We ate our breakfast and lunch and had our afternoon cocktails at the unit... the sun was streaming in and all we could hear were waves. Watching the fishermen and pelicans and surfers was a great way to pass the time . Sayulita beach can be a bit chaotic and noisy so we were content to watch it from our balcony. We ate at Si Senor, downstairs, one night at a table right on the edge of the ocean. The staff was very attentive and the food was delicious. The other nights we walked into town for dinner. This was a memorable short trip away from the rain and we will definitely be returning. Thanks so much! Great to have you too and hope we can be your Mexican home away from Canada!!!! Villa Tranquila is a great place. We really enjoyed the open concept and watching the surfers from our living room. The unit was beautiful through-out. Everyone from Sayulita Life were great. We hope to be back soon. The most amazing time we’ll spent with family and to be able to make fun new memories with them cannot wait to do it again. The service and people were all amazing. Villa Tranquila represents the heart and soul of Sayulita. The unique intricacies and craftsmanship were appreciated. The Villa is spacious with a open floor plan showcasing the ocean and spectacular views. It's actually hard to leave the villa to enjoy the splendor of Sayulita. We were a party of 3 adult females enjoying a Mexico reunion. The kitchen and dining area can accommodate family meals and cooking. We choose to eat out in Sayulita, as all dining experiences seemed to be better than the previous "OMG this is the best meal, ever", experience. We took advantage of the yoga available through the Villa Amour, loved it, a jungle/ocean experience. The O restaurant is good with the best views is Sayulita. The infinity pool is a lovely refreshing perk. A short hike takes you to Playa los Muertos, we did most of our ocean swimming there. I could go on forever writing about the splendor of this Villa and Sayulita. We had a incredible experience with pleasant memories. Nicest place we ever stayed. The atmosphere at Villa Tranquil is like nothing we ever experienced before. The weather was amazing, the open floor plan is incredible, and the views are absolutely breathtaking. It's hard to pick a favorite part of this villa, but being able sleep to the sound of waves (with windows and doors closed or open) was pretty spectacular. The location is great, getting to the beach is a few minute walk, and town only a few minutes more. Great shopping, restaurants and culture to explore. Sayulita is a must visit, and Villa Amor, particularly Villa Tranquila a MUST STAY. We just got back from Sayulita and had an amazing time! Villa Tranquila is fantastic! When you walk in, the views take your breath away. The entire living room/kitchen is open to views of the entire bay. You can see the beach and town, all the way out to the point accross the bay and beyond. The weather was great so we spent a lot of time just sitting and enjoying the views when we weren't surfing out front. We started every morning with a short walk to Playa Los Muertos for a family swim (we have two kids 8 and 10), then walked to the main beach in town where we stayed the rest of the day surfing and enjoying all that the town has to offer- good food and fun shops. Mary's was great for dinner, but you can also get excellent tacos from numerous stands around the town. The gelato at the waffle place was great too! We loved Sayulita and will definitely be back to stay in the beautiful Villa Tranquila! Thank you Gabbi and Nick for making this trip absolutely perfect! !